I’ve always loved pugs. Their squishy faces, curly tails, and big-dog personality just make them irresistible. 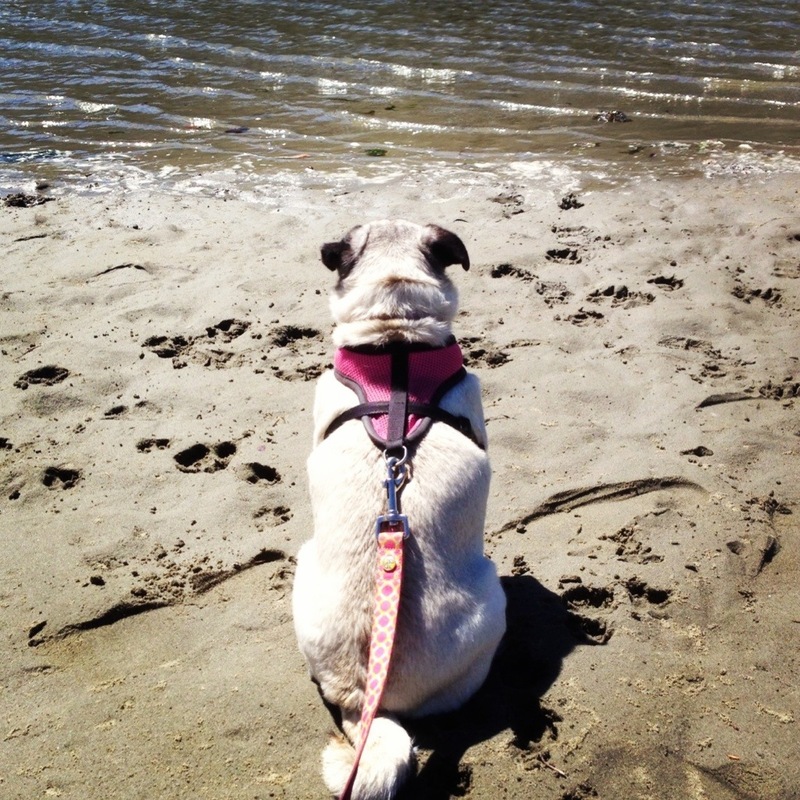 In November 2012, Brendan and I adopted Bessie from Pug Pros, a rescue group based in Sacramento, CA. She is completely blind. I joke that one of her eyes looks like Mad Eye Moody, one of the characters from the Harry Potter series. Before we adopted her, I read the book Inside of a Dog: What Dogs See, Smell by Alexandra Horowitz to get better insight into dogs’ senses. What I learned is that a dog’s sense of smell is their best sense and sight is helpful, but they aren’t dependent on their sight the way humans are. To put it in perspective, Horowitz writes that we might be able to smell a teaspoon of sugar in our coffee, but for a dog, they could detect a teaspoon of sugar in two Olympic-sized swimming pools. With that in mind, I read what I could on the internet about blind dogs and began my journey with Bessie. I wanted to share some tips here because so many people ask me what it’s like to have a blind dog. They feel bad for her or think that it must be hard for her. But the truth is, Bessie is the most resilient, fearless, and silly pup I’ve ever met. I also wanted to help dissauge any fears potential adopters might have about adopting a blind dog. Be their seeing-eye human. The misconception a lot of people ask me is “You don’t take her for walks, do you?” I do. Like all dogs, she loves to sniff and explore new neighborhoods. But the biggest adjustment for me is realizing that I am her eyes. She usually walks behind me, adorably bumping into the backs of my legs sometimes. When reaching curbs, I usually stop and tap my leg so she knows where I am. Sometimes she stumbles on a curb, but she keeps on going. Make noise. I usually tap my leg or clap my hands and Bessie will find me. You’d be surprised how fast she can find me. Don’t move furniture. We’ve moved twice since adopting Bessie and I had read that you shouldn’t move the furniture once they are settled in. I found that she usually spends two or three days walking around the new area and bumping into things, but after that searching period, she knows the lay of the land. Now that we’re settled, I don’t move furniture so she knows her way around. Be patient. I’m very lucky because we also adopted Buddy several years ago and he’s a dream dog. Just sweet, mellow, and listens to commands (most of the time). With Bessie, I had to learn to be more patient with her. It takes a little longer to walk her and I need to keep an eye on her more. But she’s taught me how to be patient. Pet a blind dog on their side, not their head when first approaching. I call Bessie a little snapping turtle. If a stranger wants to pet her, I ask that they say her name and pet her side so as not to freak her out. She can sometimes snap at the air if a hand is trying to pet her head. Imagine if you had your eyes closed and someone reached for your face—it would freak you out too. It’s best to speak a lot and pet slowly. In general, she loves hearing voices and will wag her curly tail in response, so I find talking to her helps her know where I am. I hope you will consider adopting a blind dog because they are just as kind, loving, sweet, and silly as their seeing counterparts. If you have any questions, please post them in the comments. Bessie, doing what she loves best, sitting in the sun. We’re chilling out on the beach in Mendocino, CA, while on vacation at The Stanford Inn. Ah! Bessie is so adorable Jennifer!! I would like to rescue a dog when I live in a place where I can (my landlord won’t let me) so it’s good to know about blind pups who may really need a home. Thanks, Melissa! Bessie is a sweetheart. I hope some day when you’re looking for a pup that you find the right dog for you. There are so many great ones out there just waiting for a wonderful person. Such a great post! I hope more people consider adoption. Thanks so much, Angie! I always hope that people choose adoption over buying a dog or cat. There are so many wonderful sweet cats and pups waiting for a good home! My family and I are adopting a blind pug this coming weekend. His name is Dozer. We are super excited! That’s so great, Mary! Dozer is a very lucky pup. You’ll find that Dozer will always know when food is around even if he can’t see it. Bessie always seems to find food and beds wherever she goes. Thanks for adopting and saving a life! Did you adopt your dog?? How has it been?? I’d LOVE to hear the pros and cons of your process and the things you’ve come across/found out since the adoption. 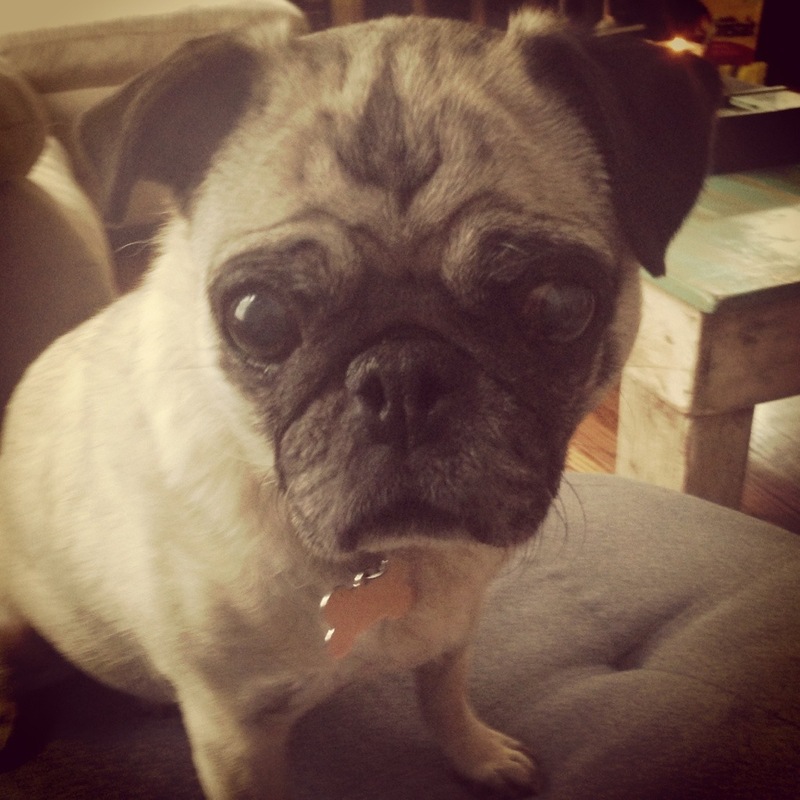 There’s so many things you don’t know about when adopting a special needs pug/dog, I’d love to hear your thoughts and feedback. Hi Brad: Yes, I’ve adopted all my pets from either shelters or rescue groups. I think there’s a misconception that buying a dog is easier than adopting a dog because the adopted dog will be a lot of work. I adopted a cat and two dogs through rescue groups and a shelter. All pets need time to adjust to your home. You need time to adjust. Every dog needs training, no matter if they are a puppy or a 5-year-old, when you are both new to each other. All of my pets have been special needs. Our cat Bentley had cancer about a year after we adopted him and we ended up having his back leg amputated to remove the tumor. Buddy was extremely overweight when we adopted him at 5 years old (he was 118 pounds!). Bessie was blind when we adopted her. For each of them, we addressed their needs by caring for them, showing them love, researching what they needed, and working with great vets. It does take time and patience to work with a special needs pet. With Bessie, it took us time to adapt to her needs. But the wonderful thing about pets is that they don’t feel sorry for themselves. None of them moped around. They learned to adapt and they figured things out. They are incredibly resilient. You can read more about Buddy and Bessie in a piece I wrote for The Bark about them and what they taught me: http://thebark.com/content/island-misfit-toys. Jennifer: Do you still have your blind pug? (I sent you an email with some additional questions) Hopefully you received it and will find the time to reply! Hi Brad: Yes, Bessie is still part of our lives. She’s 13 years old now. Unfortunately, Bentley our cat and Buddy our other dog have passed away, but Bessie is a fighter. She acts like she’s 6 years old, even though she’s technically a senior. Dogs, special needs or not, are wonderfully loving creatures. If you’re considering adopting a pet, try your local shelter or rescue groups. What I like about rescue groups is that they are often fostered at a home so you can learn more about their personalities and what their dislikes. But is having a special needs pet a ton more work? In the beginning, you have to learn and adapt, but after everyone is adjusted (about a month or two), they are just like any other pet. Loving, sweet, and silly!